Most people who grill outdoors know what they want, and we've built a wide variety of custom grills over the past fifteen years. Following is a small sample of our projects. This project was a collaboration with a bricklayer. It runs on natural gas, and the customer was so pleased that he used it about four times a week for the first several months. Here's an overall view of the grill. This view shows the cooking grates. The top vent serves as a warming area. Old propane tanks make excellent grills and firepits. They come in two or three different sizes that we use to make these. This grill was made from a 24 inch diameter 120 gallon tank. We cut the ends off, and added everything you see here. The result is a good cooking, long lasting gas or charcoal grill. A smoke box can be built on the end opposite the stack. All our customers have been very pleased with the performance of these units. The ends of old propane tanks make wonderful firepits. We add a rotatable , removable grill, legs, and carrying handles for a heavy duty, long lasting fire pit that does double duty: burn or cook. The pit on the left is 24 inch; on the right is a 36 inch. Some people don't want the grilling grate. Some don't even want legs (That customer put the pit in an old stump). We're flexible; we'll build whatever you want. Our customer wanted a charcoal grill with propane burners on the sides. We built him this grill, and added his burners. Now he can fix the entire meal at one time in the same place, and there's no kitchen to clean up. Social gatherings require large cooking ability. This grill was installed at a church's retreat cabin, designed to grill over 120 burgers at once. That's a lot of beef! Small families don't need big grills, at least not for a while. 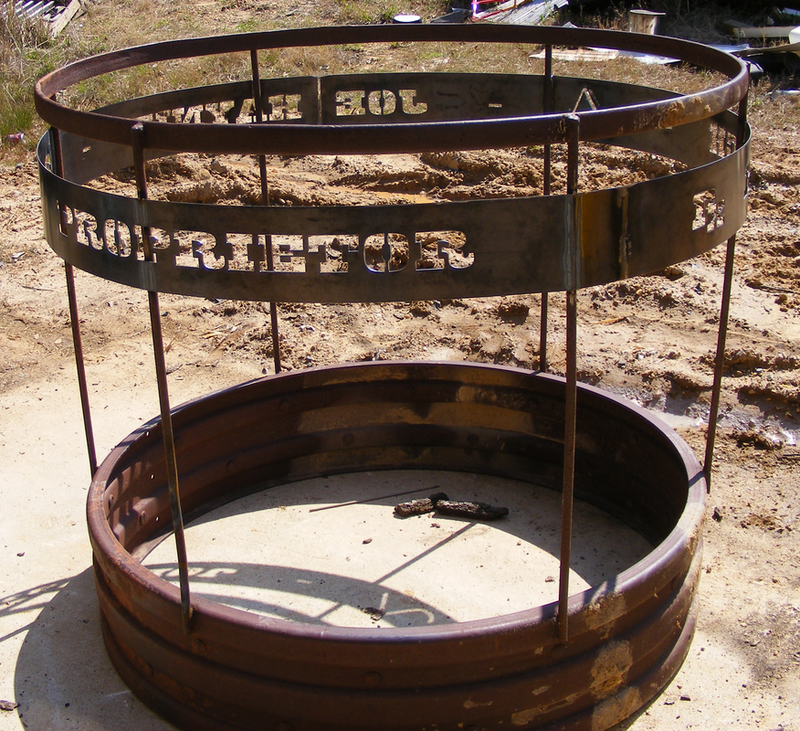 We've made some like this, out of old air tanks, for retired couples as well.